Anita Mandl was born in Prague and came to England shortly before the outbreak of war in 1939. After leaving school, she went to train as a zoologist at BirkbeckCollege and worked for 18 years in biological research in London and Birmingham, gaining a Ph.D. in 1951 and a D.Sc. in 1960. For much of this period she attended evening classes at Birmingham College of Art. In 1965 she married and resigned her University Readership. Since then she has been carving in ornamental hardwoods, soapstone and marble. Her highly polished surfaces eliminate detail and show off the beauty of natural materials. She also experiments with two-tone effects. Polished surfaces are contrasted with chisel or scratch finished areas, or with resin inlays. 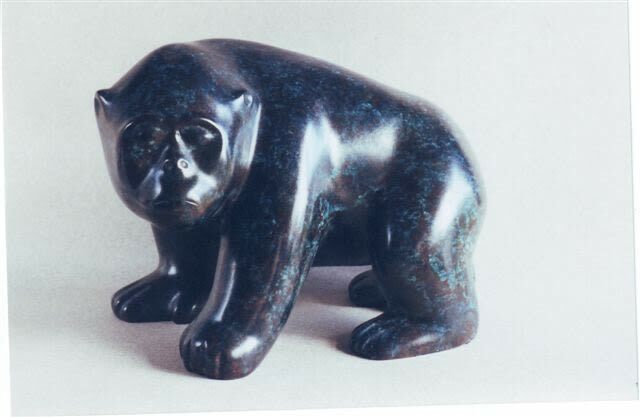 Her bronzes are made from carvings, never from clay models and are true to the form of the animal. In 1967 she became an Associate member of the Royal West of England Academy, becoming a full member in 1978. In 1972 she was elected an Associate of the Royal Society of British Sculptors, becoming a Fellow in 1980. Anita Mandl exhibits regularly at the societies to which she belongs. Her work has been shown at the RoyalAcademy on seven occasions, and for some years was at display at the BusinessArtGalleries, Burlington House. In 2002 she was one of four Czech sculptors at the New Academy Gallery's exhibition in London and she now has work in various private and corporate collections, including Pictet Fund Managers and Mercury Asset Management.